I took this photo about a month ago. I was out riding along HWY 21 in Madison County when I spotted this distinguished, well kept barn. So many of the barns in this area are having a difficult time staying in good repair. 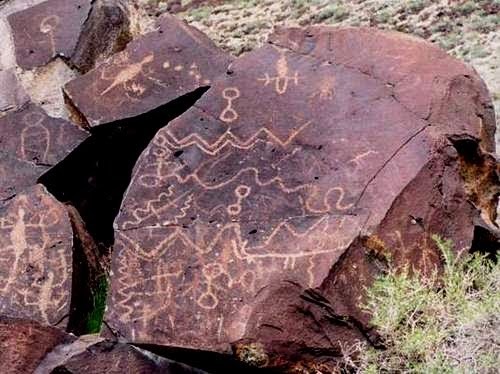 Some actually falling to the ground for their final resting place -- and with that loss the disappearance of cultural stories. 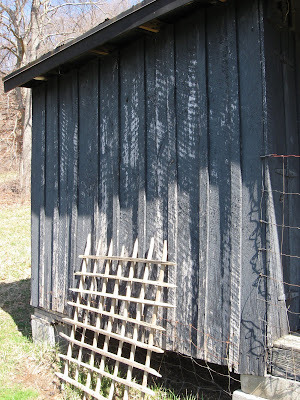 I feel barns have moods, depending on the weather conditions and their state of health. Above the substantial, blackened barn is wrapped in the cool, misty day reflecting a lightness upon the land. 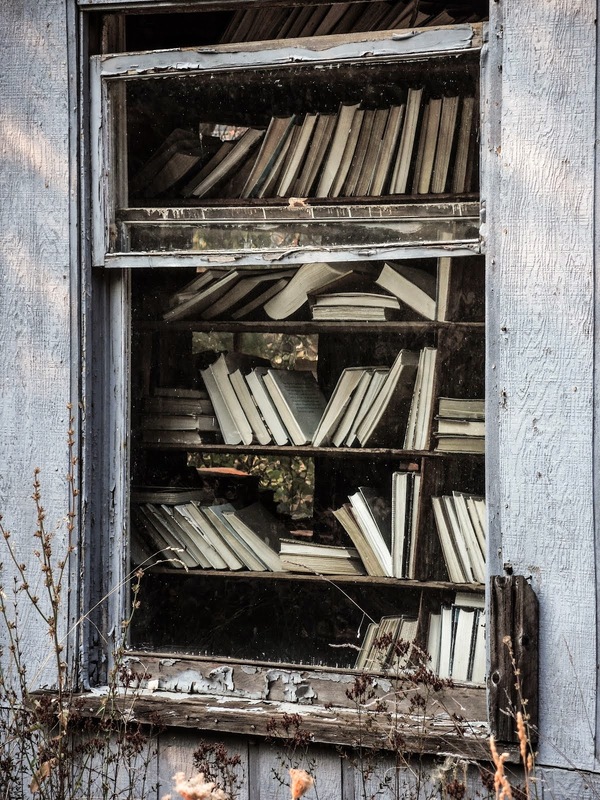 Over my adulthood life, I have always had an interest in old artifacts, especially those containing the written word. 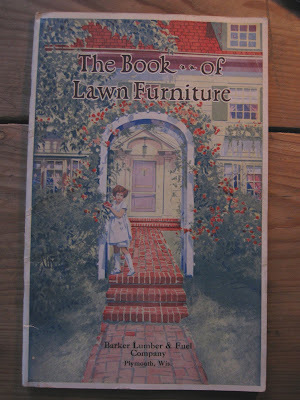 Perhaps twenty years or so ago I picked up this old 36 page catalog that dates from 1928. The distributor of the catalog was Barker Lumber and Fuel Company, located in Plymouth, Wisconsin. The publisher was The Long Bell Lumber Company located in Kansas City, Missouri. Anyway, at the time, I thought it was a great illustrative catalog that could be of benefit to owners of old homes desiring to replicate the appropriate vintage look around their homes. Recently, I have thought that some of the catalog ideas could be used around heirloom vegetable gardens also. 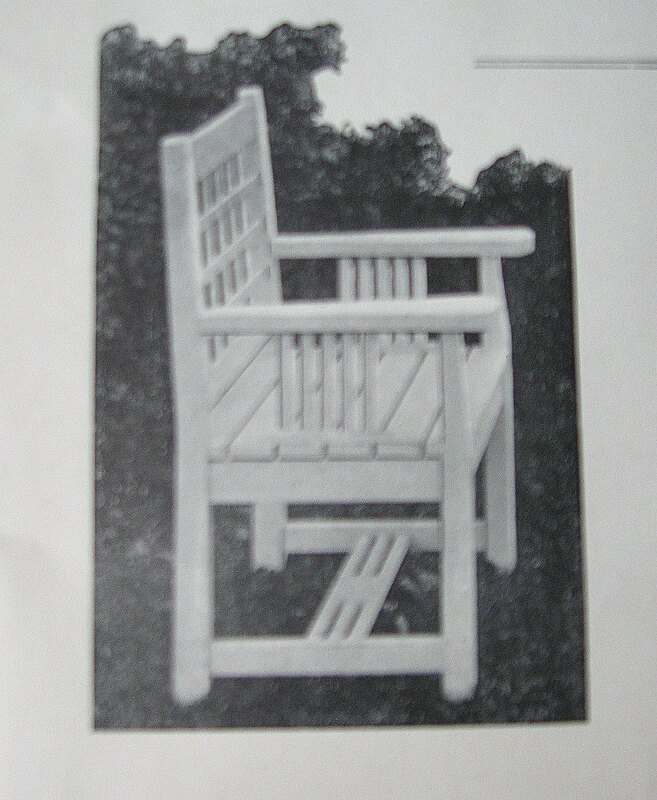 The catalog was not selling outdoor furniture rather it displayed an item then gave a (sorta) building material list of lumber sizes needed for a woodworking project to complete the item pictured. In 1928 home and local carpenters were more prolific in the local community. This was the days when "industrial already made" outdoor furniture was still in its early stage. Below is a representative gallery from the seventy-six black and white photos featured in the catalog. I would be glad to provide anyone with a list of building materials from the catalog for any of the items below; just ask for the list in the comment section. They are rather sparse lists. Perhaps these photos will bring back memories of vintage family photographs taken outside next to a wooden trellis or similar wooden structure. They do for me. WHAT'S HAPPENING WITH OUR SEEDS? 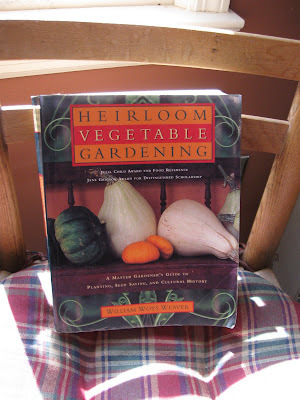 I bought William Woys Weaver's book in 1997, titled Heirloom Vegetable Gardening. Since the time of its 1997 copyright it has become a classic for heirloom seed savers. In the book he provides in-depth research, cultural history, and personal stories related to the heirloom seeds that he is familiar with. He traces how family vegetable gardens moved to industrial gardening (gardening for profit) in the mid-nineteenth century. Weaver's book was and still is an important piece for people wishing to know more about heirloom seeds. 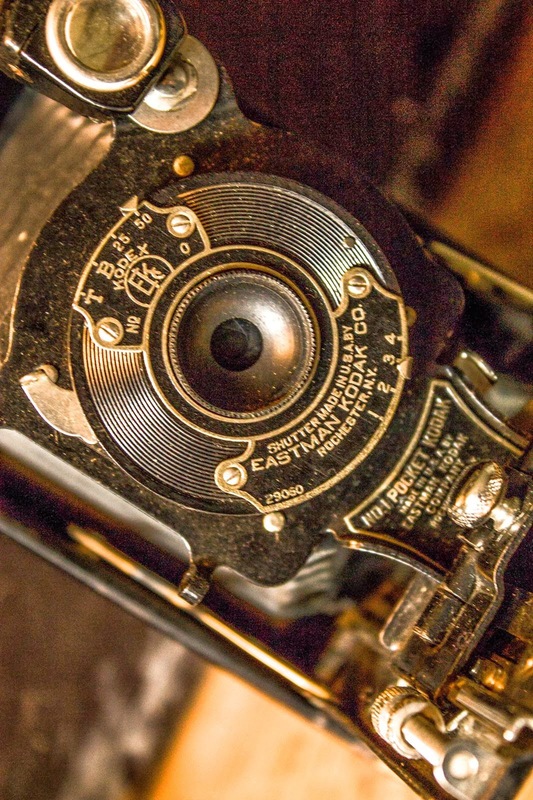 Moving on from Weaver's well written book lets take a close look at heirlooms. Well, they are open pollinators and have adapted themselves to certain regions of climate and soil over eons of time. 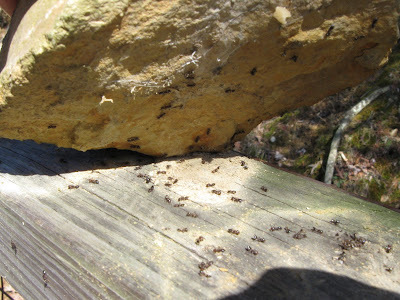 They often are resistant to local pests, diseases, and extreme weather. They are tough "guys" if planted in their regional domain. What they aren't is hybrid or GMO seeds. They contain strong genetic traits while industrial seeds or hybrids contain weak genetic traits. Heirlooms are important to the world as they can override many of the problems of modern day seeds such as disease and pests. Heirlooms are vital to the world's food system. The South contains rich pockets of heirloom seeds saved from family to family, friend to friend over many years of growing vegetables, flowers and fruits. More so than other regions of the country. So why are we encouraging corporate, industrial farming when we know their genes are weak? A simple answer is, profit. Corporations have been buying up many of the old seed companies that had heirloom seeds resulting in many of the seeds from these old companies being lost. The pool of seed diversity shrinks with the passing years. What are we doing about this shrinking cache of heirloom seeds? Many things. 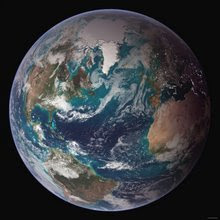 In the past decade part of the seed savers movement was about establishing world seed banks around the globe attempting to save this rich diversity. Actually there are 1,460 banks around the world. One bank, ICARDA, has 131,000 varieties within their stores of 5.4 million seeds. These banks need to keep the seeds in long term storage under ideal conditions -- where there are regional conflicts or little money the seed banks are at risk. The largest seed bank is the Svalbard Global Seed Vault that opened in February 2008 in Norway. It is the ultimate in safety for seed biodiversity and protection of our global food. Here is an idea how you can help save the threatened heirloom seeds. 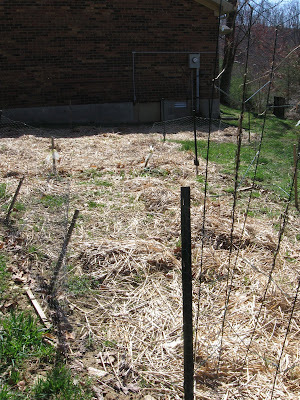 Start planting some (better yet all) heirlooms in your gardens and flower beds each year. 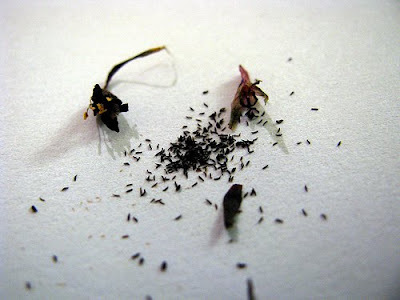 Maybe even start trying to save seeds from these plants for next year's garden. You will be rewarded with hardy plants and you will make a difference to our world by saving a bit of our plant heritage. Svalbard Global Seed Vault from the Decorah Tribune, Decorah Iowa. 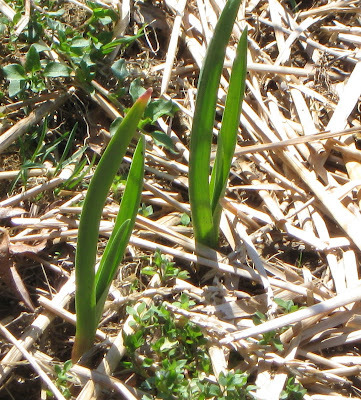 The Vernal Equinox happens at 1:32 p.m. on Saturday, March 20, 2010. That is tomorrow for me as I write this post. 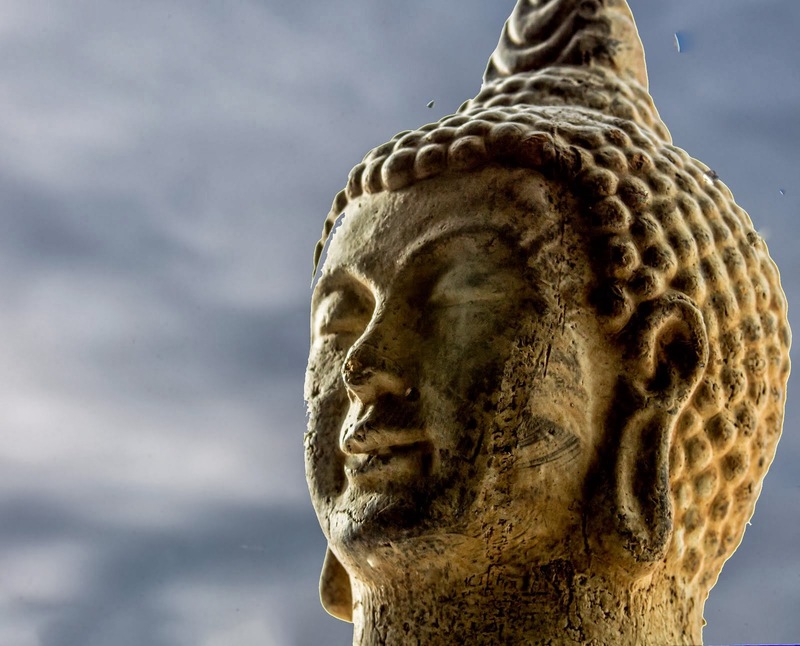 This is the day of an equal part of daylight and an equal part of night. 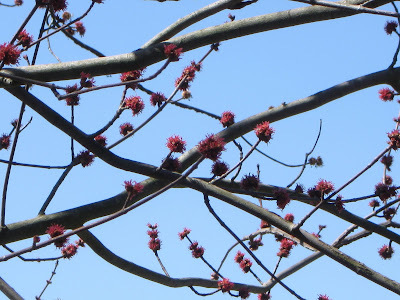 Spring will officially be here! Here is a quote from Henry David Thoreau, found in his journal dated March 18, 1858. The Blog of Henry David Thoreau recently featured this quote and I thought it would be appropriate to celebrate the Equinox. Each new year is a surprise to us. 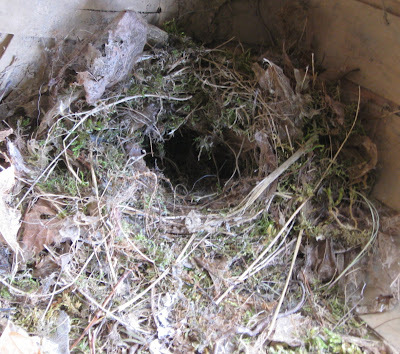 We find that we had virtually forgotten the note of each bird, and when we hear it again it is reminding us of a previous state of existence. How happens it that the associations it awakens are always pleasing never saddening: reminiscences of our sanest hours? The voice of nature is always encouraging. Today is St Patrick's Day and I thought it would be appropriate to put a photo on of the above barn that I found in Jackson, County Kentucky a few weeks ago. The sign stuck above the open doorway says, CLOVER BOTTOM. After all, a clover is a symbol of Ireland as well as one of the symbols of St Patrick's Day. I, myself am half Irish. I call it my better half. My family came to Canada in the mid 1800s and formed kinship and Irish clans in the area. Many of this clan crossed over the border into Michigan at the beginning of the 1900s. Irish were a close knit group back then, keeping to themselves as they were regarded as second class during those early times. But the good thing is, it kept the Irish strain together as Irish married Irish. That is how I can claim that I am half Irish -- I know the genealogy trail. Today, in the U. S. many St Patrick traditions have come about. On the "day of" one should wear green or expect a pinch, drink green beer, eat Irish food, or if you live in Chicago expect to see the river turn green. All fun and a day when everyone is looked upon as Irish. The clover or the shamrock as it is called in Ireland, has a history dating back to the ancient Celts. Its original meaning was that the three leaves represented; gods, goddesses, and time and balance of energies. 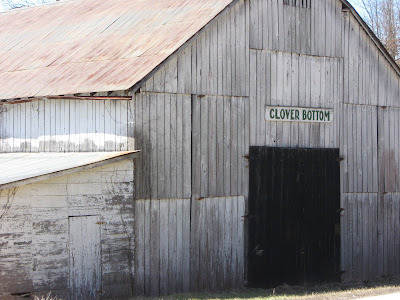 And, oh yes, the Clover Bottom barn in the above photo -- it is actually a designated name for a "place" in Jackson County. I had heard of the area of Clover Bottom but when I went searching for the place I had difficulty finding it. 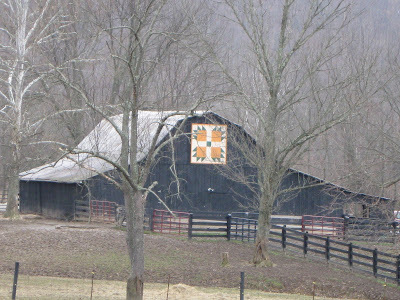 The sign on this barn was the only hint that it did indeed exist. Maybe it is a mystical place like many of the old stories told by Irish leprechauns? 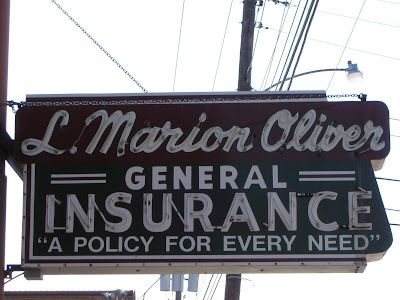 Around 1950, L. Marion Oliver, an accountant, insurance agent and an attorney installed this overhanging neon sign on his business in Berea, Kentucky. 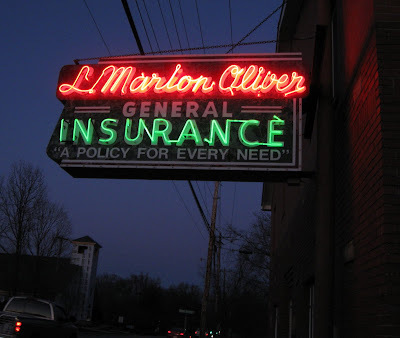 Its luminous light became a beacon of advertising along the main route through the small town. This beacon of light was called a neon sign and was a new type of store signage in the U. S. beginning in the 20s and 30s. Today it still lights up at night on Chestnut street as the second generation of Oliver brothers carry on this family type of business -- Rodger Oliver as an attorney and Doug Oliver as a certified account. They chose to keep the sign as they figured it was not only a family heirloom but a community heirloom. 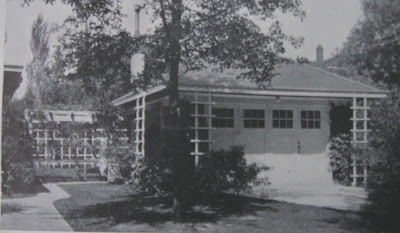 The two-story brick Oliver building was built by the Oliver brother's father. A brass plate by the front entrance door announces the building date. The building could be called art modern of the 50s. In excellent shape both within and out reflects the, "pride of place," of the Oliver's. 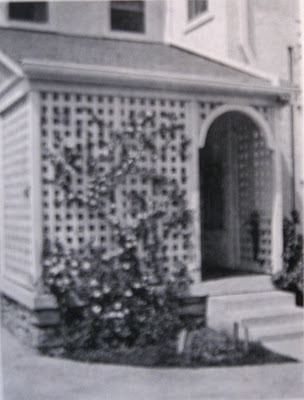 When L. Marion Oliver built the building he incorporated two apartments in the back where both immediate family and an aunt lived for a while. Today the Oliver's rent the apartments. A third generation, a daughter, an attorney, practiced in the building for a while before she was elected as a judge. Neon signs have had their ups and downs since hitting the commercial world in the U. S. about 80 years ago. After their flurry of success they tended to bow to plastic signage that came in with the plastic revolution. The beautiful neon's took a dive with the exception of owners that maintained their neon signs. A few of the reasons that neon's had a difficult time staying in the lime light was changes in ownership, sloppy maintenance, zoning regulations, and the general populace feeling that that were passe. 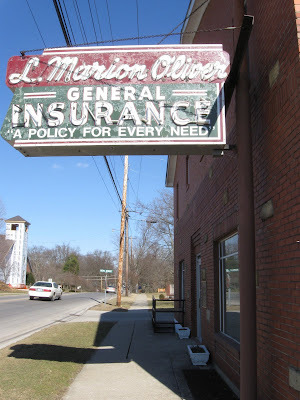 Sometime during the Oliver's neon sign's history the city of Berea passed an ordinance that there were to be no overhanging (the sidewalk) signs installed on Berea's commercial buildings. Luckily, after the Oliver's request to grandfather their sign in, the neon got a reprieve from the new regulation and remained in place. Their experience is an example of how zoning regulations nationwide could cause these brilliant signs to be extracted from buildings. 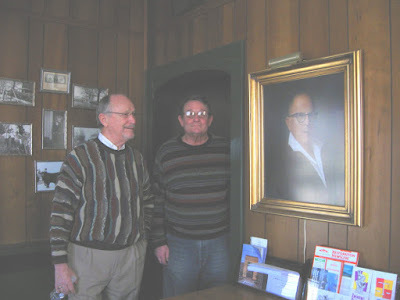 As I talked with Doug and Rodger Oliver I realized the importance of remnants and pieces of a town's local businesses. 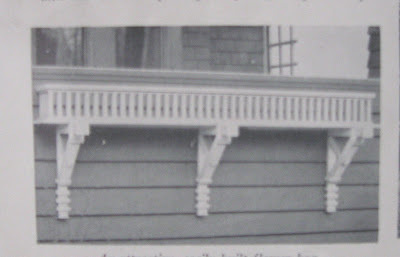 These "pieces" are a sign of continuity for the community and should be encouraged by the town's folks to remain as reminders of the town's sense of place. 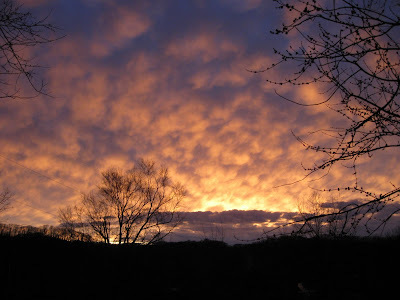 My evening sky from my home on Bear Mountian, after our rain storm. I needed to turn around and go back down the other way on a rural road that I was driving on. I spotted a nice turn around church parking lot and pulled up the hill and swung around to go back down and out -- heading back the way I'd just been. 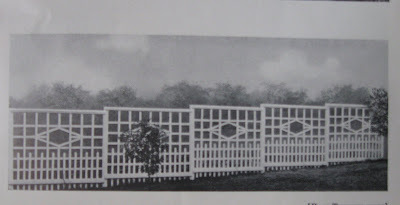 But, as I reached the top of the hill and glanced behind the church toward a small stand of trees I noticed some lovely Victorian fencing. I stopped. 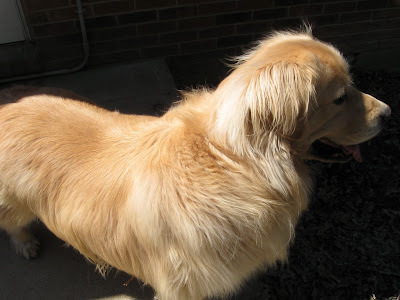 I got out. And, I walked over to take a closer look. 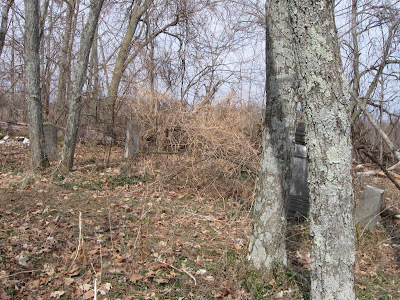 I was now looking at a small folk cemetery that I quickly assessed as mid to late 1800s. I had recently read a non-fiction book titled, Love Cemetery: Unburying the Secret History of Slaves, by China Galland. The book had certainly piqued my interest in folk cemeteries. It is a remarkable story of unearthing the folk stories of the families that were buried in Love Cemetery. 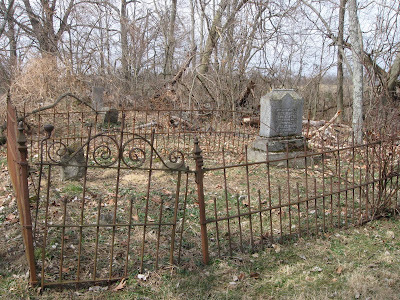 But this post is not about Love Cemetery, it is about Poosey Ridge Cemetery located behind Poosey Ridge Community Church in Madison County, Kentucky. The name, "Poosey" was the name of the Native American tribe that lived in the area at the time of pioneer settlement. Today, the Poosey area is rural with a small population. Not an incorporated town but a "place." It is difficult to pick out the tombstones in the woods above. There were about eight that I could spot. 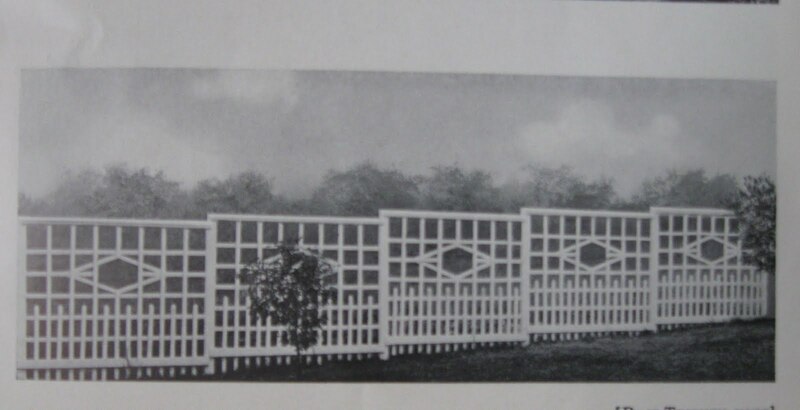 These eight were located outside the Victorian fenced family plot (see photo at the top). 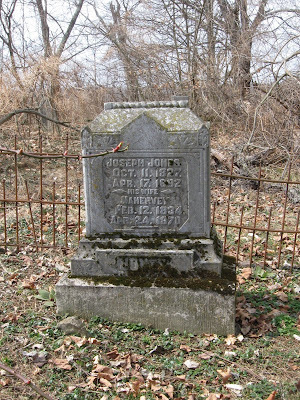 Terry Jordan and D. Gregory Jeane have written well researched papers and books on folk cemeteries. Also Southern Graves website provides information. Southern folk cemeteries have certain traits. I have gathered the following from the writers I have mentioned in this post; 1) grave tombstones of a "make do" quality, 2) pine and cedar are sometimes found on site planted by the caretakers of the cemeteries, 3) contains a family plot/s that is surrounded by curbing, shells or fencing, 4) lacks creative ornamentation, 5) small size, 6) rural area, 7) tombstones face east, 8) wife buried on the left, husband on the right. A folk cemetery does not have to meet all these criteria, just a few will do. 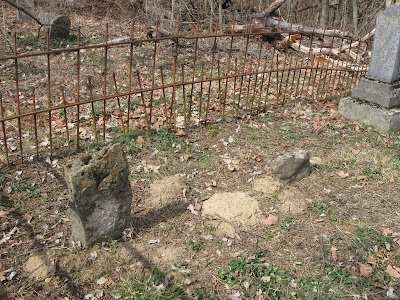 Poosey Ridge has five traits to verify that it is indeed a folk cemetery. they are; 1) has, "make do," markers 2) has a family plot, 3) small size, 4) rural, 5) lack of creative ornamentation.
. . . cemeteries are a good place to accumulate information that can provide insight into a community's social and economic structure, its religious tenants, and its ethnic composition. And finally, a quiet walk through a cemetery can be meditative and reflective. This past weekend was sunny and rather warmish compared to what we have had this winter. This kind of weather brings out people as well as wild critters. You choose the category you fall into. 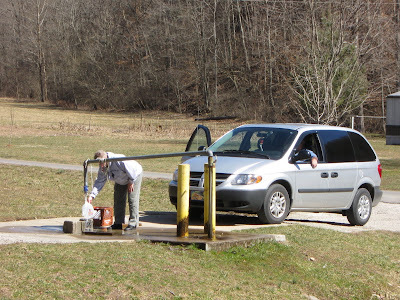 I figured it would be a good day to travel up to Climax where I could collect gallons of drinking spring water. It's a curvy, rural, climbing road to the springs but the beautiful views are unsurpassed for these parts. Almost non-existent traffic. Climax is neither a village, town nor city -- it's is just a country "spot." 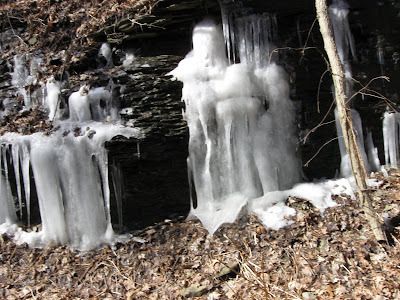 Rock outcropping along my way produce seeping springs -- now frozen solid like cave stalactites. 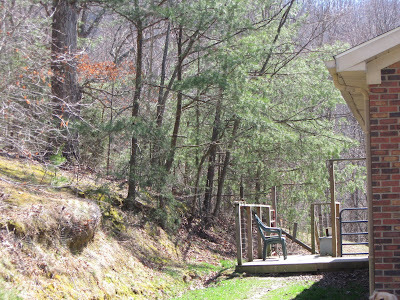 Kentucky has large areas throughout the state that are geologically known as karst areas. 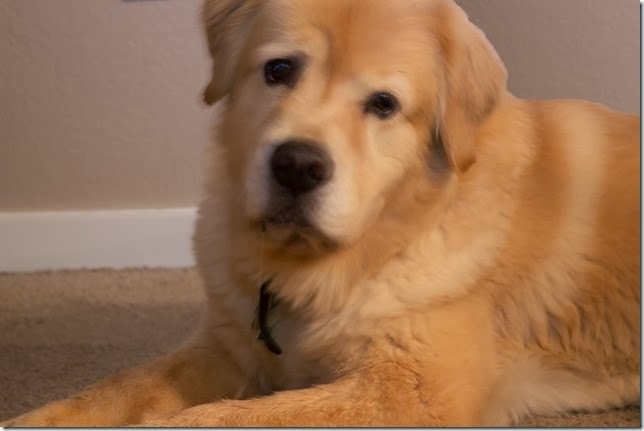 What is a karst? It is a landscape with sinkholes, sinking streams, caves and springs. 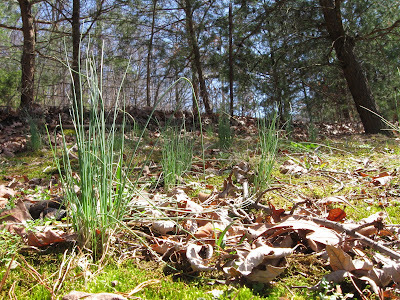 In the areas of the state that are considerd to be a karst landscape one finds limestone bedrock. 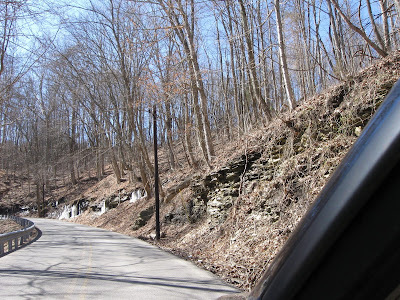 I live in a karst area and the route I was driving today continued along a karst landscape. 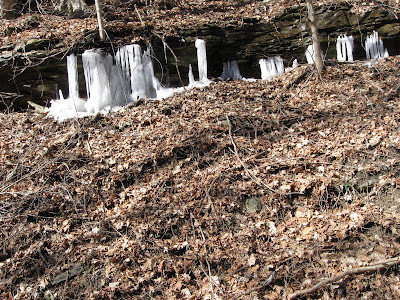 CLOSE-UP OF THE ICED SEEPING SPRINGS IN MADISON CO.
My route takes me from Madison County into Rockcastle County. 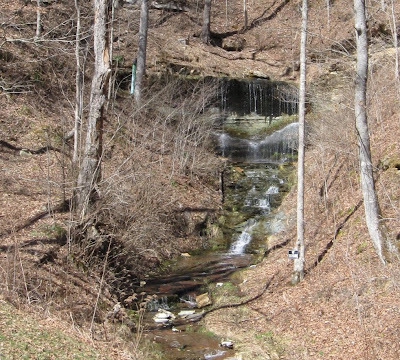 According to the Kentucky Geological Survey, Kentucky is one of the most famous karst areas in the world -- formed over hundreds of thousands of years in a continuing process as water moves underground from hilltops toward a stream through tiny fractures in the limestone bedrock. 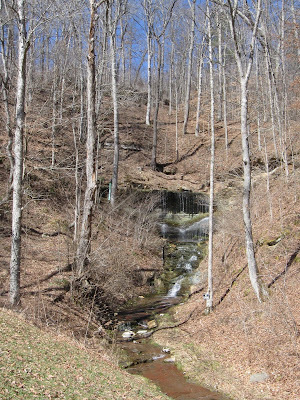 CLIMAX SPRINGS SEEPING FROM ITS OUTCROPPING, ROCKCASTLE, COUNTY. After my pleasant drive I arrive at the "spot," Climax. Here a large natural spring flows down into a captured area where local folks can fill their many gallon containers with drinking water. The surrounding area is pristine for miles and the water tests clean. The taste of the water is pure, void of water treatment taste. It's cold and free! The collection site is just down from the large spring area at Climax. Captured in an underground cement tank it flows up and through metal piping that has an on and off spigot. When you turn the spigot on, the water gushes out hard and fast. Aren't I lucky to know about this place. Thanks Mother Earth. Debbie and Kenny Hylton have raised 14 acres of tobacco on their land for many years. They are family farmers, farming in Madison County, Kentucky.It being one of the states that was part of the tobacco buy-out imposed by Congress in 2004. Today instead of fields of tobacco around every roadway, one finds the fields lying fallow waiting for other types of crops to someday be planted. 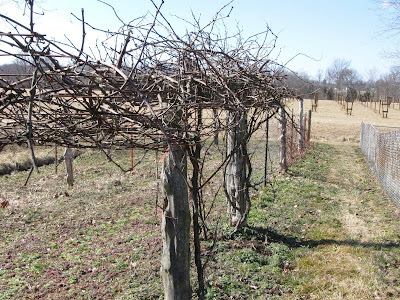 The Hylton's came up with the idea of blackberries and this 2010 year will be their first crop. After their years of tobacco farming and the subsequent monetary drop of tobacco, Debbie and Kenny recently decided to take their life-long knowledge of farming and raise a different crop. Debbie said, "We've always farmed so we wanted to get started again with some type of growing." 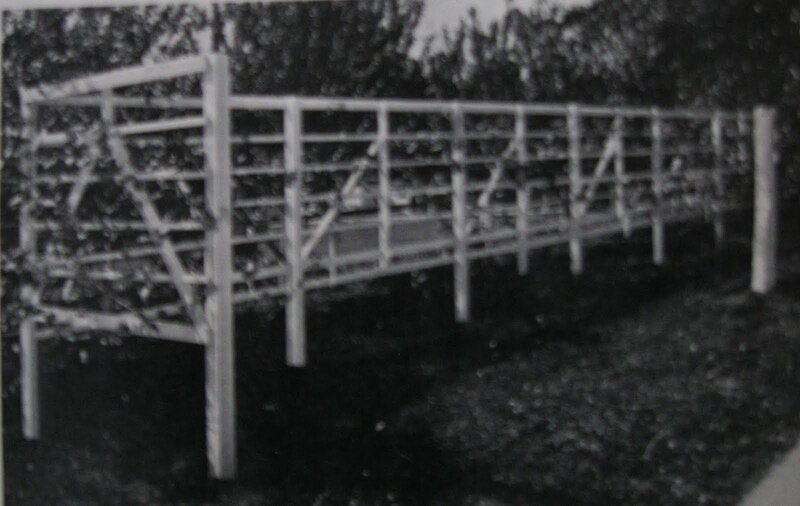 The initial start-up idea produced a blackberry arbor built with branches collected from the trees on their property. 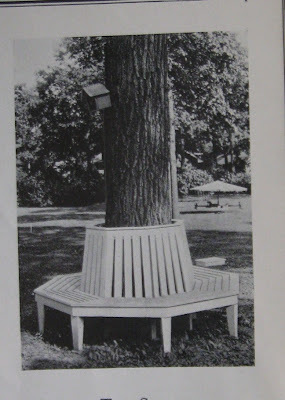 Kenny left the bark on the branches that he used to build the arbor -- the lateral supports as well as the upright posts. 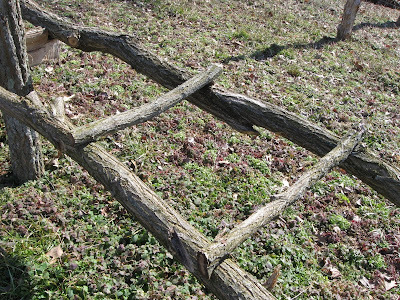 This new arbor has an earthy, natural look and the cost was right. 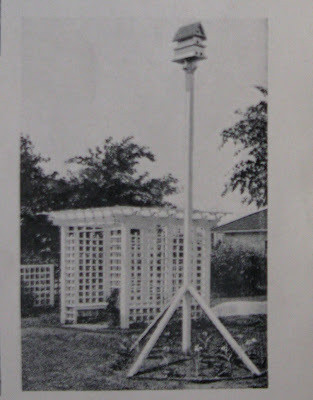 But the arbor was not large enough to produce a selling crop -- and a selling crop is what Debbie and Kenny had in mind. 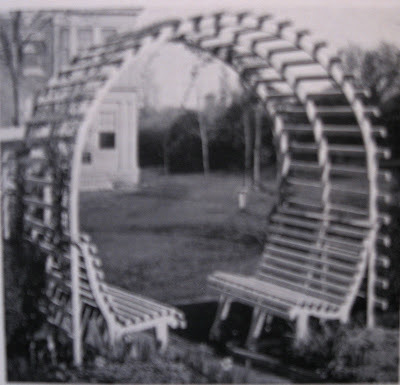 So, Kenny did not stop with just a small arbor. 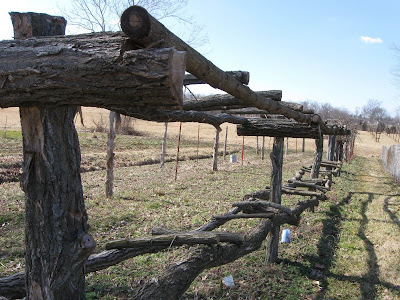 Last fall he built trellises on his farm acreage for future blackberry crops. Both of the Hylton's look forward to possibly selling blackberries at farm markets. Kenny continued with his new crop idea by building trellises in the fields that once held tobacco. Right now they stand ready to accept the berry bushes that will climb upward on them. I heard a phrase recently that seems to suit the farmers hit by the tobacco buy-out -- you strive to survive. 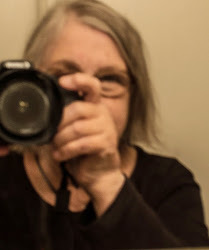 As I was getting ready to leave, Debbie, with a big smile on her face said, "Come back later to see the blackberries twined in the trellises and full of berries." And I smiled back and said, "Thank you, I would love too." 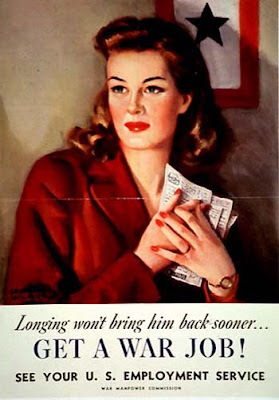 So an all out national campaign began to persuade woman to fill men's vacated traditional jobs usually in factories. Factories that were being retooled to produce war machinery rather than items such as cars and appliances. White women gained employment in factory jobs easier that black women. 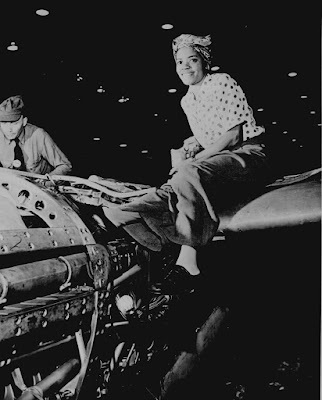 In 1943 automotive plants had not hired any black women workers but were hiring black men. Corporations, under pressure from the government reluctantly hired black women. 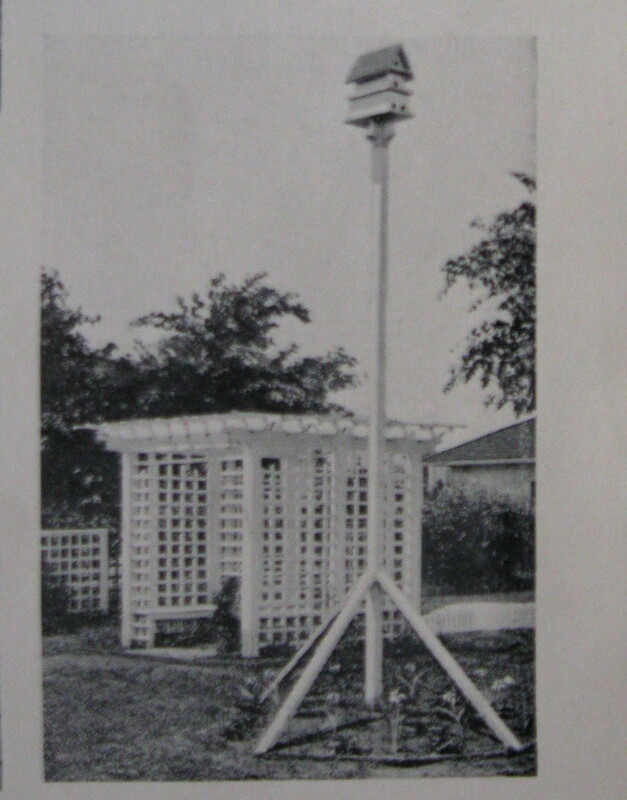 Vocational schools were set up to train women in jobs important to the cause. 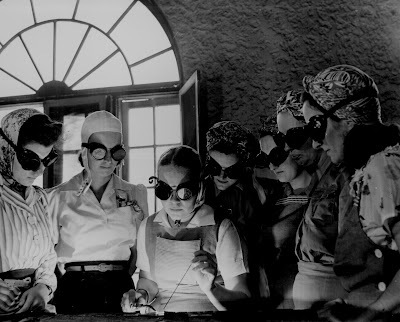 Secretaries, housewives, and waitresses trained at these vocational schools for future war work. 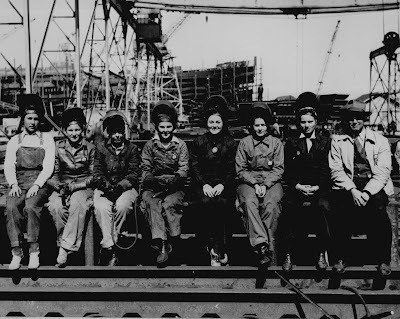 During the peak of using women, 1943 to 1945, women only held 4.4 percent of traditional jobs in factories. But this effort by women changed woman's role in our society. Dress habits of wearing slacks became more prevalent in woman's everyday wear. Women had shown their worth in traditional jobs that men usually held -- they proved they could handle most jobs presented to them. This work performance was the catalyst that slowly moved through our nation resulting in the woman's movement of the 1970s and -- the rest is history.